The beauty of jazz is that it is music containing the sound of surprise. Most jazz musicians only plan what they are going to play, not how they are going to play it. So it may be different each time it is played. Then there is the jazz jam, the descarga. Things heat up as the jam progresses. The group gets tighter and the music starts to flow, bubbling like a brook, tumbling like a waterfall, roaring like a river in flood. Making it up as they go along, the jazz jam may not be a big deal for seasoned musicians. But to jam a recording session and do it all in just one take… Now that is really something—close to a miracle. Now it’s much more than just a jam. So was Alma Records producer, Peter Cardinali in over his head when he dreamed up this project? Jaws may have dropped, but on evidence, for all the wrong reasons. Here on One Take, Volume One is the miraculous evidence of four superb musicians getting together to pull it off. And Alma captured that on CD and DVD simultaneously, which makes it even more remarkable. 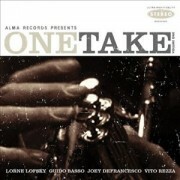 One Take, Volume One brings together the mighty Canadian jazz guitarist, Lorne Lofsky, venerable flugelhorn player, Guido Basso, and percussionist, Vito Rezza with the magnificent Hammond B3 of none other than Joey DeFrancesco. Although listeners are sure to find the CD breathtaking, the DVD is highly recommended as well. Nothing—not even the finest sounding CD—can completely replace the experience of “being there” at the moment when the music happens. When these magical moments of melody, harmony and rhythm unfold on the unsuspecting ear and find their way to the innermost recesses of the heart and mind’s eye they will remain vivid and be remembered long after the sound of music has vanished into the night. For this reason alone, the DVD will hold pride of place in any music library shelf. The CD, of course recommends itself, being one of a kind and playable anytime, even when you cannot afford the intrusion of the picture. Now, what makes this project unique is not necessarily what makes it a resounding success. This is largely due to the simple fact that the atmosphere was electric. Musicians knew what they were committing to tape and also the fact that had just one shot at making it work. Remember, this is not just a jam, but also a one-take jam. There is so much respect here. No one is leader, just four fine musicians getting down and making the impossible happen. The super session kicks off with producer Peter Cardinali defining the challenge, and the musicians deciding who will call the tunes. Basso calls Rogers and Hart’s “My Romance.” He also states the theme with his hallmark luscious, warm tone and then proceeds to take a beautiful, understated solo for a couple of choruses. DeFrancesco eggs him on with the occasional growling chord or resonant flourish. Lofsky solos next and in the first few notes provides notice of why he is one of the most valued interpreters of song and also one of the leading solo guitarists in the jazz scene in Toronto. His solo is crafted with flighty exuberance, almost the antithesis of Basso’s warmth—almost personifying the moment when lovers intertwine—one playing off the sensuousness of the other’s shy skittishness. DeFrancesco’s solo is full of dazzling twists and turns as the inner drama of the song unwinds. If the DVD is to be believed, then this is just a warm-up and is followed up—without flourish—by Frank Loesser’s classic, “If I were a Bell.” By now the band is really cooking, with Basso and DeFrancesco describing and defining the song from its head. It’s taken slightly faster than Miles Davis’ classic readings, with Rezza adding a touch of humor as he sounds the bells at the beginning of the track. There is also some fine interplay between the musicians—especially when Rezza takes his star turn when he extrapolates the theme. Lofsky calls the next tune, “My Funny Valentine,” and proceeds to define the pace as well. By now the unit is really cooking. Basso’s flugelhorn plays low notes that one never really thought were possible on a flugelhorn. Lofsky’s fretwork is fluid, and he paces his solo with an unmatched sense of space. DeFrancesco’s playing slightly behind the beat is also quite special, as are the clever changes throughout the song. Rezza and DeFrancesco together shape “Someday My Prince Will Come” as a slightly faster waltz. By now the group is steaming and nothing can come between the magic and the music, which gets even more adventurous from here on. Solos are more risque. Notes are more twisted. Harmonics are grabbed from out of thin air and every musician is heard digging deeper—from the upper register of the fretboard to the highs and lows of the flugelhorn, every musician stretches outside his comfort zone. DeFrancesco is particularly awe-inspiring on “Someday My Prince Will Come.” He appears to have unearthed the magical nature of the protagonist’s longing for being united with her love. During the final choruses of the song, the interplay between musicians sharing and exchanging bars with Rezza is also fascinating. Rezza also unearths otherworldly tones from his range of drums and his subtle shading is also near perfect, thanks to masterful use of brushes. The session peaks on Tom Jobim’s “How Insensitive.” Here every musician navigates the twists and turns of the many-layered emotions of the song as if they were privy to special secrets, as if they know of the intimacy that exists every time you negotiate a Jobim song. Basso by now has found a link between flugelhorn and trombone and almost sounds like both. DeFrancesco is dazzling once again and you can see why he has the two finest hands—especially his effortless left hand—on the Hammond B3 since Jimmy Smith and Larry Young. And Lofsky’s reading of the song is, once again, just perfect with his breathtaking glissandos and chordal variations. Richard Carpenter’s “Walkin'” is no less a wonder. DeFrancesco and Rezza are particularly exuberant and recall the electricity of that day when Miles Davis made this track his own. Now you can feel yourself awaiting the end. Here producer Peter Cardinali apparently had a surprise for the group—especially DeFrancesco. The DVD tracks him as he emerges from the recording booth with a score-sheet with his arrangement of Lucio Dalla’s extraordinary chart, “Caruso.” Apparently none of the musicians had heard of this track. So the sound of surprise takes on new meaning. Now Cardinali invites the musicians into his recording booth, ostensibly to hear the original. They emerge from the booth and appear to be fired up. Not only is the track an inspired choices for a date such as this, but the musicians appear to be moved by the music. DeFrancesco is spectacular as he opens the melody; Lofsky and Basso give mesmerizing performances on guitar and flugelhorn. You know now that if the session does not end here, the emotion and the electricity of the event will dissipate completely. And so ended the first of one of Alma’s most ambitious projects. As a listener you find yourself asking whether the session was a success. The answer comes faster than you would have expected. And the moments of magic will last a very long time indeed. The DVD also features some interesting features—including the “Food for Thought” segment, which provides a subtle hint as to why the session was such a resounding success. A word about the CD: this is an analog recording that is digitally mastered. So the quality of sound is truly life-like. Tracks: My Romance; If I Were A Bell; My Funny Valentine; How Insensitive; Walkin’; Caruso. Personnel: Joey DeFrancesco: Hammond B3 organ; Guido Basso: flugelhorn and trumpet; Vito Rezza: drums; Lorne Lofsky: guitar. Peter Cardinali: producer.